My book is free all this week in recognition of National Disability Employment Awareness Month. 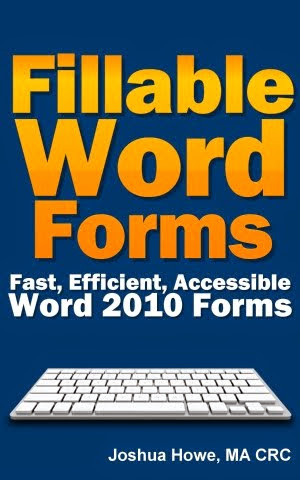 This is the missing manual to creating fillable forms using Microsoft Word 2010 which are fast, efficient and accessible. Drawing on the fields of graphic design, web development, rehabilitation and the author’s experience creating hundreds of forms, this illustrated step by step guide walks you through the form creation process. From creating a logical layout and selecting the right font to inserting fillable fields which can be read by (are accessible to) users who are blind, this guide will teach you the mechanics and the why behind good form development. You will also get tips and tricks on managing your forms to reduce maintenance and how to speed up your forms creation process. Whether beginner Word user or experienced pro, everyone will find something new in this book. You don’t need a kindle to read this book. You can still read it for free on any computer or tablet using Amazon’s free software.